What is an ancient tree? The definition varies from species to species, so a silver birch may be ancient at 150 years old, while an oak of the same age is still a baby. But if you find yourself gasping, “Wow, that tree’s fatter than anything else like it around here!” you’ve probably found one. If you’re tempted to hug it, don’t hold back – ancient trees are essential to biodiversity, providing homes to thousands of species. Hugging is also the easiest way to measure a tree’s girth, to get some clue to its age. The “British standard hug”, as defined by the Woodland Trust, is 1.5 metres (5ft) from fingertip to fingertip. Here are a few notable specimens; you can find 80,000 more, or log your own discoveries, at ancienttreehunt.org.ukAncient Tree Hunt. Estimated to be at least 3,000 years old and possibly 5,000, this is the oldest yew in Britain. In 1769 its girth was recorded as about 17 metres (55ft). Today you can see only remnants of the old plus new growth amounting to no more than two hugs – a shadow of its former glory but still remarkable. This 1,000-year-old tree stands in a field at Manthorpe, near Bourne. 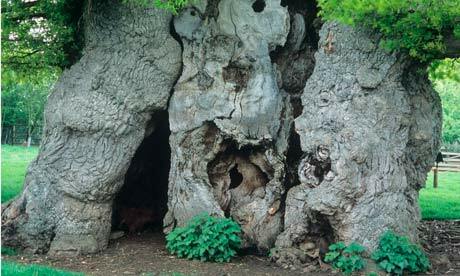 Its hollow trunk has been used for parties; at one point, it is claimed, three dozen people managed to stand within it. Possibly more than 4,000 years old, the tree in the grounds of St Dygain’s church in Llangernyw is one of the oldest living things in Wales. This fine oak is thought to be somewhere between 500 and 700 years old, making it probably the oldest tree in Northern Ireland. It is one of many ancient trees in Belvoir Park Forest. Under this sycamore in the village of Tolpuddle in 1834, six poverty-stricken agricultural labourers formed the first trade union in Britain. Among more than 300 veteran trees in the grounds of this castle near Leominster is an avenue of magnificent sweet chestnuts. Some of them are rumoured to have come from nuts from the wrecks of the Spanish Armada in 1592.